Scouting report: A convivial neighborhood spot with zero frills but some of the best burgers around. Signature dish: The menu is extensive, but the MVP is the burgers. Go for the Texas Burger, eight ounces of beef smothered in wing sauce and melted blue cheese crumbles, with a side of tater tots. The sports vibe: A dive that still allows smoking (you’ve been warned), Black Bear bills itself an official Chicago sports bar, so there’s plenty of Chi-Town team insignia adorning the walls. It is an awesome time to be a Chicago Cubs fan...emphasis on the word awesome. However, the segment is not Baseball With Buck. We're not hear to break down the pitching matchup for game three at Wrigley Field, no we're hear to break down the menu, more specifically the burgers at the local watering hole that caters to the Chicago faithful. The Black Bear Tavern in Buckhead is where Cubs fans in Atlanta go to cheer on their favorite Chicago based sports teams, and enjoy authentic Chicago style cuisine. While burgers are not necessarily unique to the Windy City, there are 14 of them on the menu. Now back to the opening sentence and the use of the word 'awesome'. 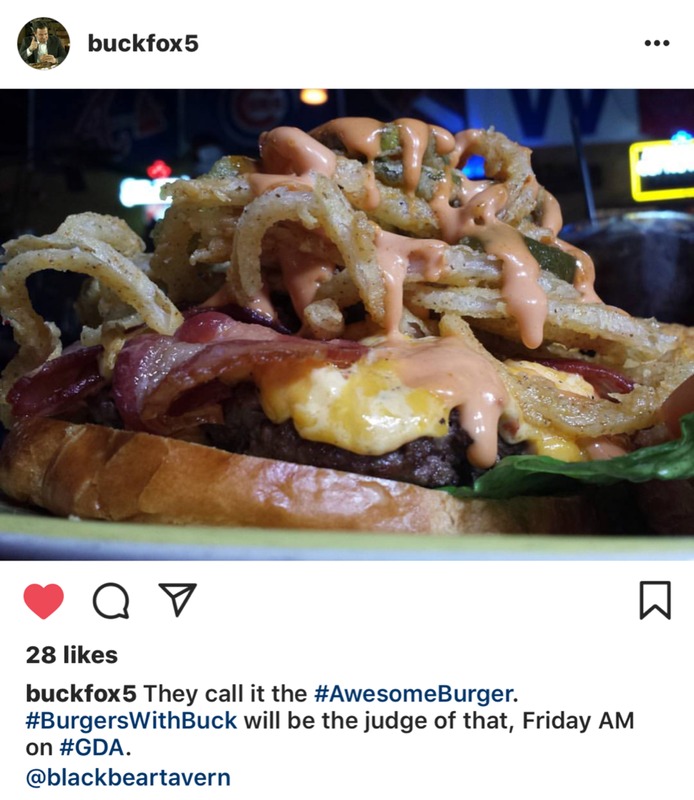 #BurgersWithBuck decided to give the #AwesomeBurger a try. What makes this burger awesome, you ask? How about this...bacon, pimento cheese, fried jalapeños, fried pickles, onion straws, spicy cajun sauce on a croissant. It is large and it comes with a choice of a side item (#BWB chose tater tots). The sign out front proclaims The Bear (as it is commonly referred to by regulars) has the 'Best Burgers in Town'. You will have to judge that for yourself because at #BWB we don't rank burgers, we just celebrate great ones. It's all a part of our mission to save the world one burger at a time. For Atlanta based Cubs fans, it is a great place to watch every pitch of every game of the 2016 World Series. For Indians fans, it's probably better to go enjoy an Awesome Burger on a travel day.